In April of 2018, Charter Communications announced their plans to launch their 1-Gig Spectrum Internet to residential homes, small and medium sized businesses. Since the announcement, Charter has released their ‘Spectrum Internet Gig’ plan to an estimated 4 more million homes. The newest market rollout of Spectrum 1-Gig will give an estimated total of about 27 million homes the opportunity to access the fastest internet service accessible through Spectrum. Charter claims to be moving progressively to offer 1-Gig service to essentially its entire 41-state footprint and should be completely rolled out by the end of 2018. 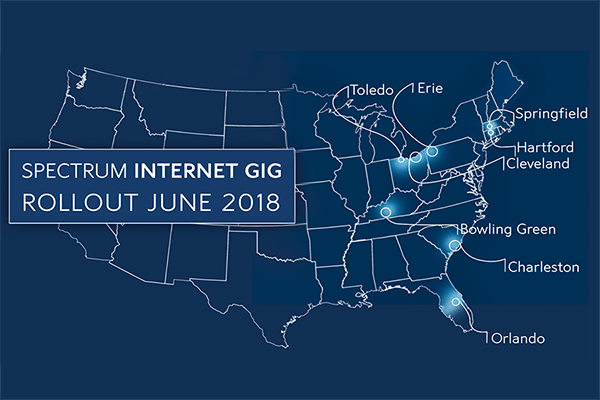 1 Gig roll outs slated for this summer are in a dozen cities such as Orlando, Charleston, Cleveland, Toledo, Erie, Springfield, Bowling Green and Hartford. To make 1 Gig internet even better, Charter is maintaining its data-cap free stance for its customers! Subscribers would receive a downstream that would max at 1-Gbps with a 35Mbps upstream once the build out is complete. Residential ‘Spectrum Internet Gig’ plans are priced at $104.99 per month for new customers. Small and medium sized business is not being left out in the roll out either. There will be 1 Gig options for small and medium sized businesses as well in everywhere 1 Gig internet rolls out. Charter has also claimed to be doubling customer’s downstream internet speeds, depending on the market, in some 1-Gig enabled areas. Today, the majority of Spectrum’s customers have access to 100 Mbps. This rollout will mean much faster speeds and more bandwidth in these areas. What can 1 Gbps internet speeds do verses the 100 Mbps most Spectrum customers get now? Of course all the things most families love to do like stream video, online gaming and surfing the web, but also much more than that. 1 Gbps speeds has fast enough speeds and increased bandwidth to handle multiple devices streaming at the same time, automatic data backup, smart home devices, VR, and 4k streaming and downloading. To put it in perspective, the Spectrum 1 Gig internet plan has 10x’s the speeds than the 100 Mbps the majority of Spectrum customers have access to today. There has been no shortage of announcements from Charter so far in 2018 and they have continuously been making strides in efforts to give their customers the best and most effective internet available yet in their new campaign ‘the summer of gig’. If you don’t have 1 Gbps speeds available in your community through Spectrum yet, the wait might not be long. Charter’s plan is to have 1 Gig internet service completely rolled out to their markets by the end of the year. There’s no doubt we will hear more exciting announcements from Charter in the near future!